Simple operation and high quality technology in one impressive design. Diverse, adjustable, and fully automatic – the Melitta® bar-cube will prepare all kinds of coffee specialities just how you want them. Enjoy a range of diverse international specialities with the Melitta bar-cube. Experience their diverse perfection, hassle free, time and time again. The slick design fits into any background, whether a hotel, canteen, office or other. The robust surface makes cleaning simple and hassle free, while the user-friendly interface make the bar-cube a leader in self-service environments. The fully automatic Melitta bar-cube makes supplying employees and visitors with a diverse range of high-quality beverages effortless and flawless. A machine adjustable to your needs, the Melitta bar-cube offers choice in quantity, volume, brewing time and even water temperature. 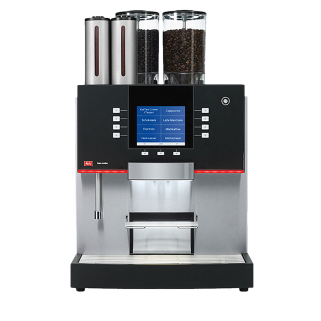 There is even a variable pressure system, allowing you to craft the perfect coffee for you, every time. To make it that be easier, you can save your favourite blends, saving you time brew after brew. The adjustable, configurable light strip are a visual highlight. While, the large graphic display and convenient menu functionality ensure a smooth and stress-free process every time. The intuitive display allows parameters to be set while status updates keep users informed about any operating stages that may be underway. Ease of use is consistent through to cleaning, the milk cleaning and hygiene program is HACCP-certified, and there is no need for daily manual cleaning of individual parts. Robustly built, the precision grinder and quality milk frother, ensure even fine grinding and a light froth that create perfection every time.